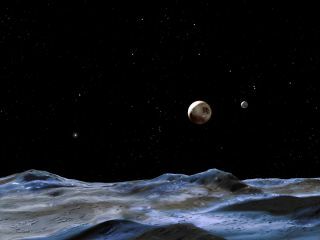 An artist's conception of Pluto's surface. A Northern Arizona University laboratory is generating strange ices like those that may be found by the New Horizons probe. Researchers in an Arizona ice lab spend long hours making crystal-clear ice from mixes of methane, nitrogen and even carbon monoxide — and now, with data from the New Horizons mission to Pluto arriving soon, the lab's time has come. The surface of Pluto is likely covered in a coarse mixture of ices that don't resemble anything found naturally on Earth. The bitter cold on icy dwarf planets like Pluto and Eris, discovered in 2005, crystallizes blends of substances that on Earth occur more commonly as gases: mainly nitrogen, with a heaping dose of methane and a smattering of other molecules mixing things up. Northern Arizona University's ice lab researchers Matt Bovyn (left), Stephen Tegler (center) and Will Grundy (right) modify the machinery they use to generate exotic ices like those found on Pluto. The ice lab at Northern Arizona University has been focusing on creating and measuring ices with different proportions of methane and nitrogen in preparation for the incoming Pluto data. They've also begun to incorporate some of the other molecules observed on Pluto to create ices of even greater complexity, Will Grundy, an investigator at the lab, astronomer at the Lowell Observatory and co-investigator on the New Horizons mission, told Space.com. Any new ice observations from Pluto's surface that can't be found in the database that Grundy and his colleagues have created will mean another trip to the lab to try and match those measurements. "We're going to be getting observations from Pluto with New Horizons that are going to light a fire under our butts," Grundy said. "Our role here in the ice lab has been sort of a support role to try and understand how ice spectra behave under different circumstances," Stephen Tegler, the chair of Northern Arizona University's physics and astronomy department and researcher in the ice lab, explained to Space.com. "Then, armed with that broad view, you can take all that information, knowledge and experience, and say, 'OK, we have this particular fingerprint pattern. How does it relate to what we see in the ice lab?'" A methane ice sample ready for investigation by Northern Arizona University's ice lab. The methane is visible in the lower half of the cell. Add combinations of different elements into the mix, which change at different temperatures, and it gets complicated fast. "Every combination, it's almost like we've got to come up with a new recipe to grow that very clear ice," Tegler said. Adding carbon monoxide, another gas present on Pluto, makes the recipes even more devilishly difficult — but also more useful to pinpointing the conditions on different parts of Pluto's surface, which might have the molecules in different proportions and temperatures. "From the point of view of doing remote sensing, anything that changes is something that you could hope to detect from a telescope or from a spacecraft, so that's a valuable thing to know about," Grundy said. "There are some things I haven't worked up the courage to try," Grundy said. "Another species that's on Pluto is hydrogen cyanide, which is even more toxic [than carbon monoxide] — and worse, it can be explosive as well," Grundy said.